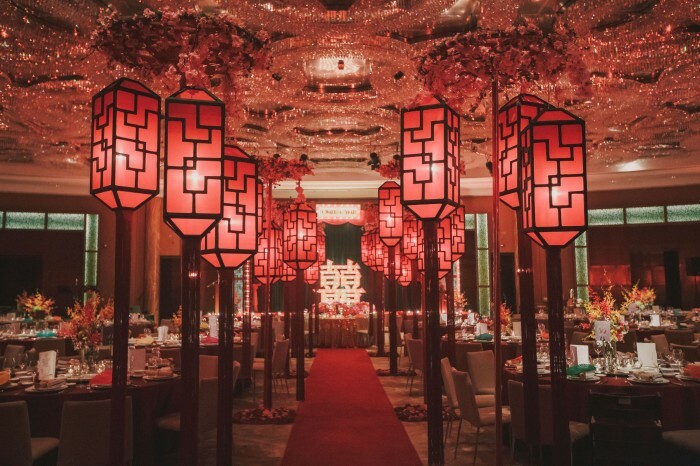 As we wind down from the festivities of Christmas and New Year, and head towards the next big celebration that is Chinese New Year, we are still very much excited about amazing displays of colour and gorgeous decor. 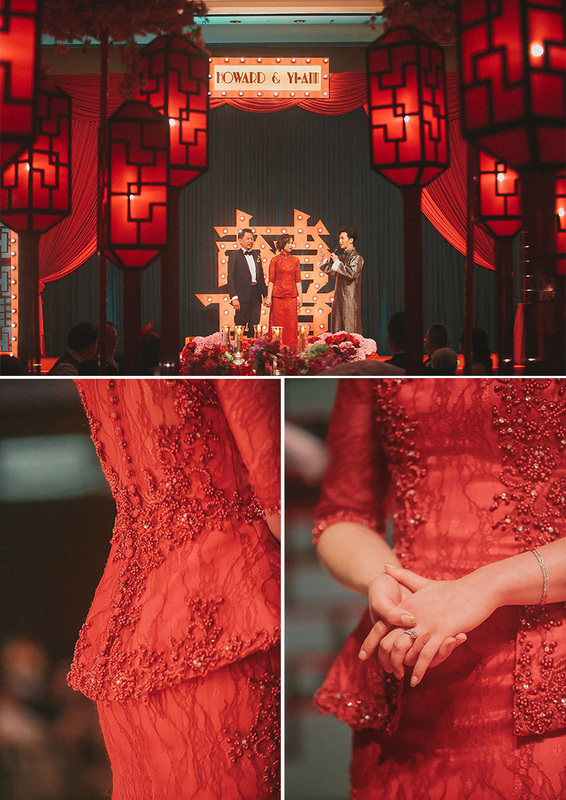 This is a great time to whip out this absolutely beautiful wedding of Howard and Yi-Ann to share with you! 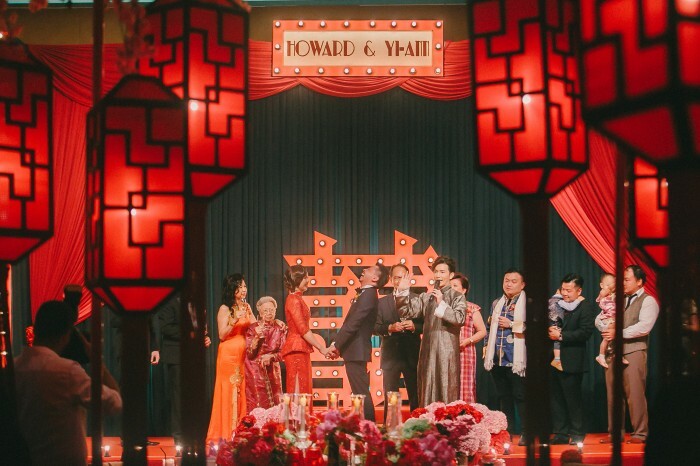 How do we even begin to describe Howard and Yi-Ann’s spectacular Old Shanghai-themed wedding reception held at Grand Hyatt Kuala Lumpur?? Thank you dear Louis Loo for the amazing photos!! Howard shares a light moment with family on the glorious stage. 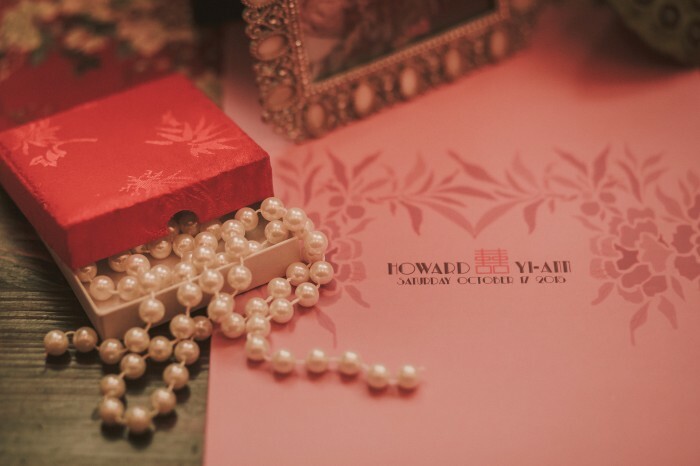 Pearls may be timeless, but essential for any vintage theme. Our couple, who reside in Australia, already held an intimate reception in Melbourne that was filled with Australian rustic essence. 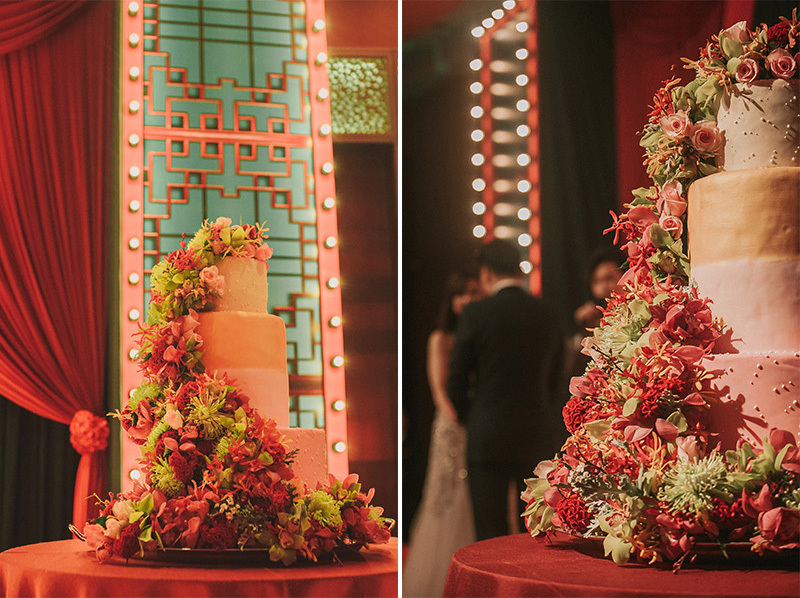 For their Kuala Lumpur reception, they decided on a traditional Chinese wedding banquet but with an unconventional twist – an “Old Shanghai” inspired theme, using a red, turquoise and green colour palette. Yi-Ann found us like many of our brides – while doing their online research of Malaysia wedding vendors. After our first meeting, together with our couple’s wedding planner Patricia Chan of MY Wedding Planner, we would be working together on one of the most amazing weddings of the year. 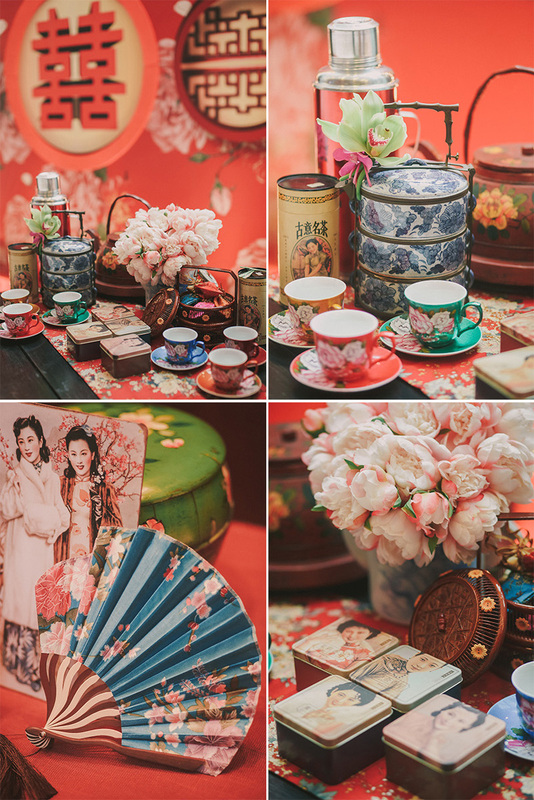 Lots of vintage details to give this Old Shanghai theme an authentic edge. 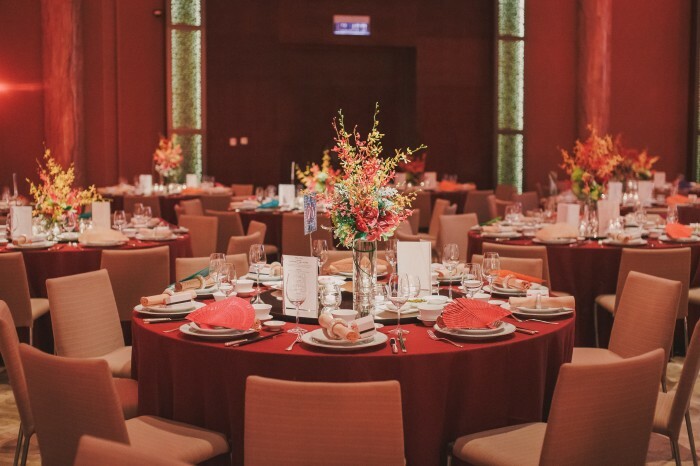 Howard and Yi-Ann were very involved in the entire process despite the physical distance, working closely with us and with their capable wedding planner, Patricia. With a project of this size and level of detail, we needed all hands on deck! Not only was it helpful that our couple was clear on their vision of and direction for their wedding reception decor, but also that they share a solid background in design and architecture. 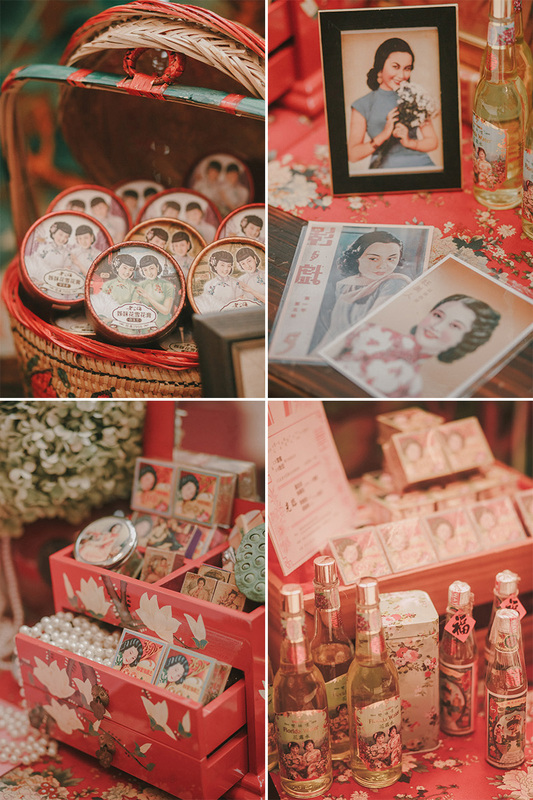 While Yi-Ann worked on the decor, Howard designed all the graphics – from invitation cards right down to the traditional candy stall descriptions. 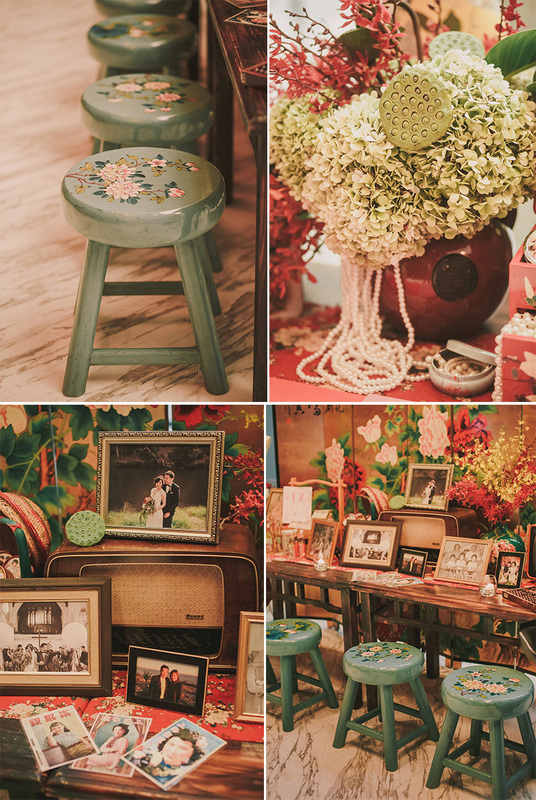 Yi-Ann’s vision for the decor was immaculately inspired with gorgeous vintage props. Our bride’s will and resolve resulted in getting exactly what she wanted to create the stunning atmosphere. A closer look at the beautiful details. 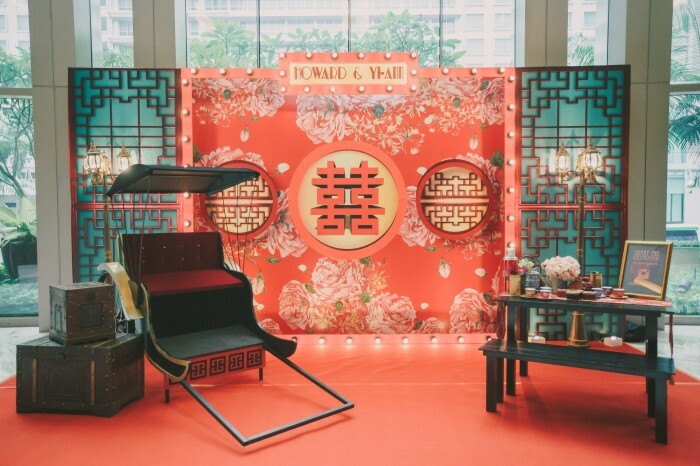 Howard and Yi-Ann’s idea for a photo booth included a traditional rickshaw! The custom-made background perfectly complemented the decor props. Precious vintage items made for excellent props. 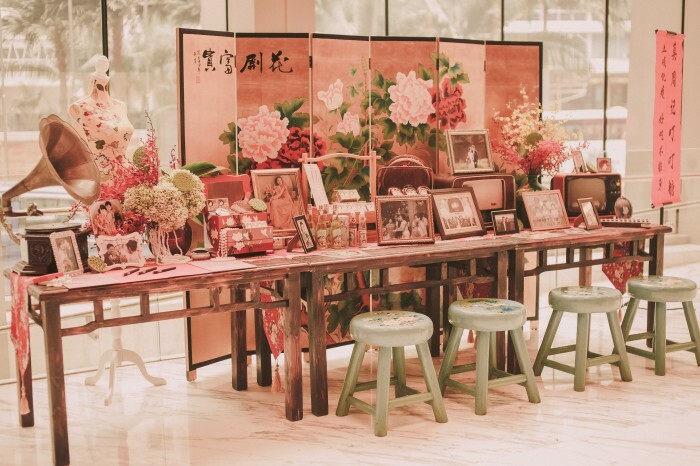 “Weddings are meant to be fun and vibrant, nothing too serious,” says Yi-Ann. So, pre-dinner cocktails were quite an unconventional experience for Howard and Yi-Ann’s guests… as you will see below! Traditional Chinese candy vendors and a talented calligraphy artist kept guests busy and entertained. 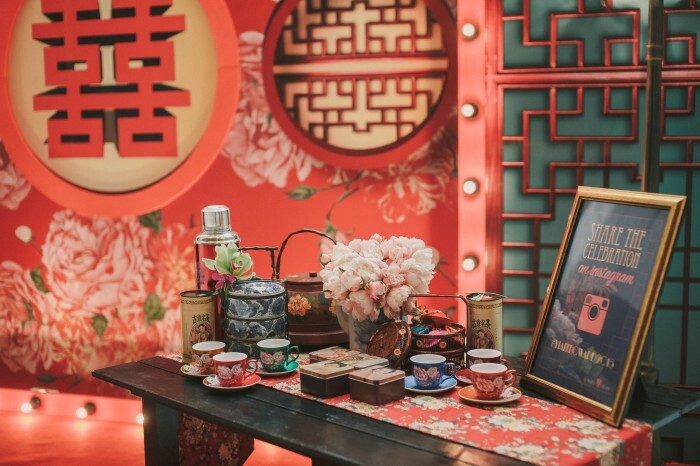 Although on a much smaller scale, the guest registration tables were also decorated in line with the “Old Shanghai” theme. Registration tables for guests of the bride and the groom are elegantly simple and beautiful. The grand aisle with towering oriental lanterns. 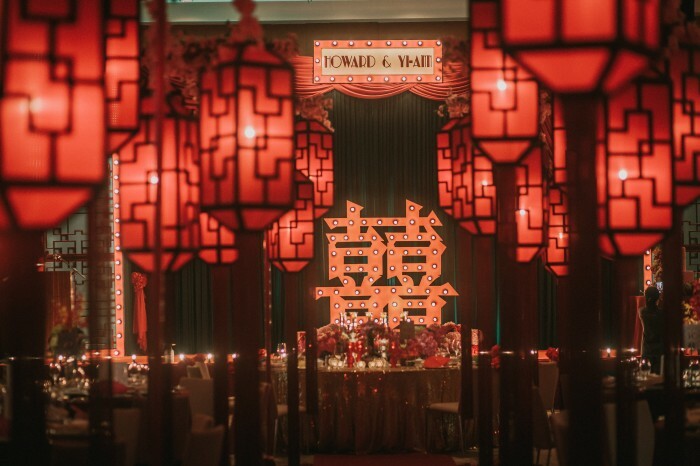 Our couple wanted a glamorous walkway with oriental lanterns, but without looking too typical. Yi-Ann found a lantern design that she liked very much, and we custom-made these lanterns for the big night. Gorgeous stage and bridal table at the end of the aisle. Creating a certain “flow” is extremely important in decorating a space such as this. With these large, attention-grabbing lanterns dominating the aisle, we needed to come up with the stage and bridal table decor that commands equal, if not more, presence. Elegantly grand with lavish textures and layers, designed to simply take one’s breath away. The vintage theatre-like stage decor looked deceptively simple, but they packed a design punch! 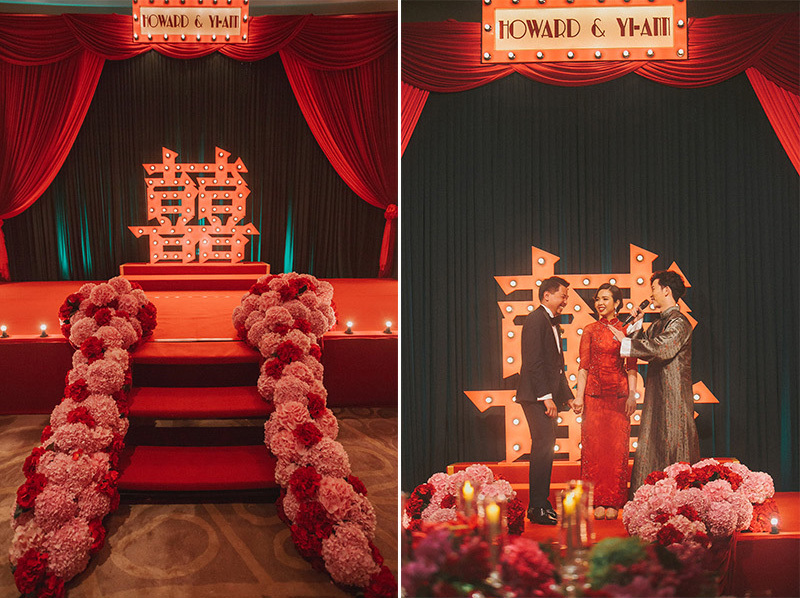 Using a giant Double Happiness sign, two layers of drapes in different colours, strategically placed lightbulbs, custom-made panel screens, everything came together perfectly and the visual aesthetics were simply stunning. Gorgeous wedding cake by Grand Hyatt Kuala Lumpur. Our couple requested the cascading flower design; flowers on the cake were the same flowers used on the guest tables. Centerpieces for the guest tables. 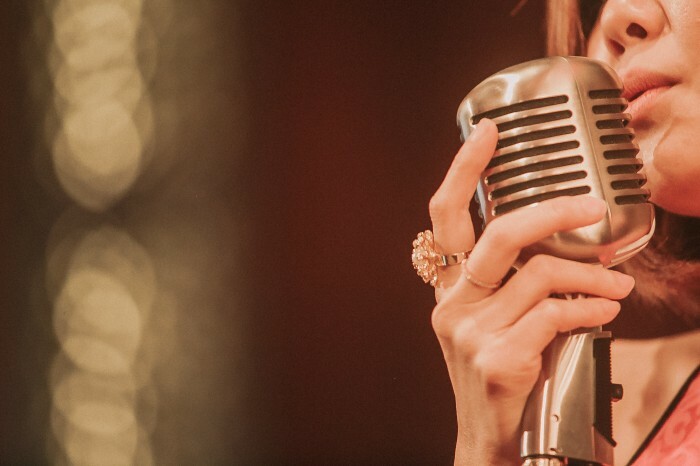 A theme-appropriate microphone for the evening! Something that Yi-Ann had always wanted were beautiful, lush hydrangeas cascading down the staging steps… and here at Wishing Tree, we make our bride’s wishes come true. Lots of big, beautiful hydrangea in red and pink for this momentous occasion. Yi-Ann, in her bespoke, all-red evening gown, stole the show every time she was on stage. So divine! 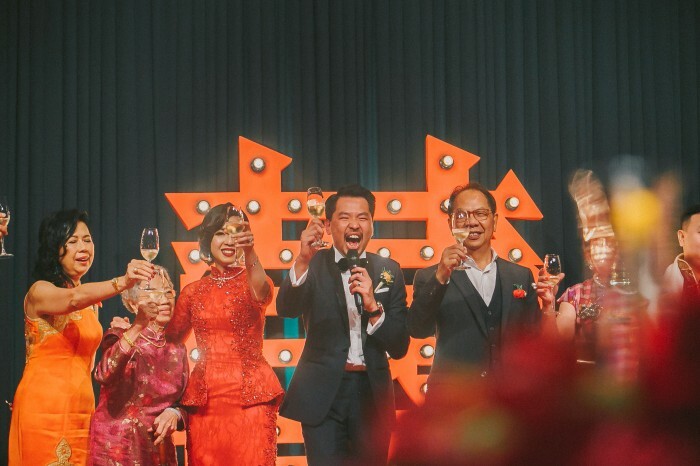 The newlyweds and their immediate family members sharing a traditional “yum seng” toast with their guests. Thank you, dear Howard and Yi-Ann for having us to be a part of your most special day, and also for sharing these beautiful photos with our readers. We wish you both a lifetime of happiness!